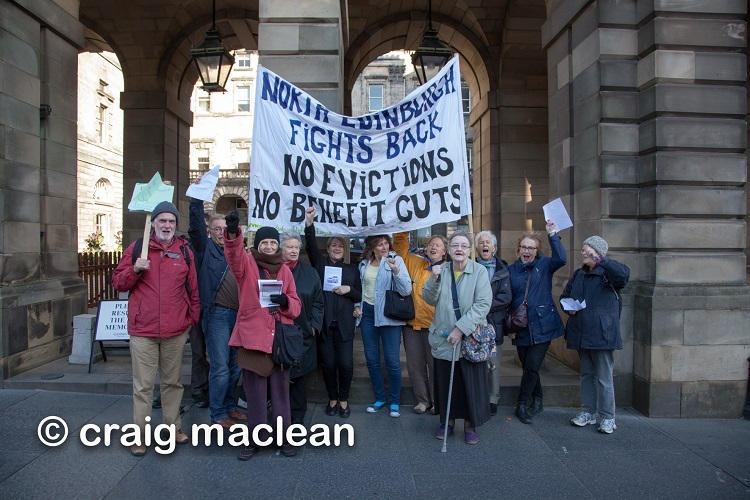 Single mothers hit by the Benefits Cap and their supporters once more descended on Edinburgh Council on 3rd October. Demonstrators protested outside the City Chambers on the Royal Mile and then moved into the public gallery to support the deputation addressing the Council committee meeting. “Scrap the Benefits Cap” and “Stop the Evictions” demand the campaigners. The Westminster government’s benefits cap is drastically cutting the Housing Benefit paid to many families, especially – but not only – lone parents. This inevitably causes rent arrears and several families in Edinburgh have been evicted by private landlords. The problem is Britain-wide and the Edinburgh campaigners have received solidarity from London – Winvisible and Single Mothers Self Defence – Dundee and Glasgow. “The Benefits Cap is imposed by Westminster, but the Council could – and must – act now to stop the evictions“, explained the demonstrators. “The Council must pay full Discretionary Housing Payment to cover the benefits shortfall – and the Scottish Government must pay the Councils sufficient funds so that DHP can automatically cover the Benefits Cap. The anti bedroom tax movement won this over so-called under-occupancy, we need the same for the Benefits Cap. The Council have started a pilot scheme to waive charges for the first withdrawal of possessions from storage (homeless people are being charged 60 pounds each time they take possessions out of storage!). Councillor Burgess told the Corporate Policy and Strategy Committee that the Greens would propose the Council approach the Scottish Government for funds to totally cover DHP for the Benefits Cap. See previous actions here and here.